For those who want to get even closer to the action, the COOLPIX S6150 has advanced features that make it stand out from the crowd. It packs a wide-angle 7x zoom NIKKOR lens that boasts a 28-196mm optical zoom, and a 16 megapixel image sensor that delivers photos so pin-sharp that even poster-sized enlargements look sensational. Getting the shot that you want could not be easier. Point the camera at your subject, and touch the 7.5 cm (3 in.) high resolution 460k dot touch screen to adjust and focus your image. For memories that demand more than an image, a dedicated movie-record button makes it easy to instantly switch to filming the action. The touchscreen also lets you scroll through your images and select and edit any that you want to get creative with. The COOLPIX S6150 includes in-camera Picture Editing, so you have access to Nikon technologies like Quick Retouch, Active D-Lighting, Soft Focus, and many others. Beautifully detailed shots are assured thanks to four different anti-blur functions that automatically minimize the effects of camera shake, subject movement or low light. Lens-shift Vibration Reduction is just one of the advanced technologies that ensures superior results, so that even if you’re shooting moving subjects at full zoom, the COOLPIX S6150 will deliver clear, crisp pictures every time. 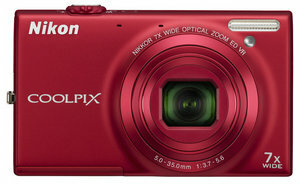 The COOLPIX S6150 comes in four colours: violet, black, red and pink.